There is a comforting but unlikely trope in most pandemic fiction which has scientists devising a safe and effective vaccine at the last minute - and even more miraculously - somehow manufacturing and deploying the vaccine around the globe in short order. The reality is far more complicated, and far less comforting. The oft heard mantra that `It will likely take at least 6 months before the first doses of an emergency pandemic vaccine will be available' envisions a `best case scenario'; one where the vaccine involves a simple strain change (like in 2009), or where an emergency vaccine has already been developed and tested. And it carefully ignores the questions of how much vaccine will be available six (or 12 or 18) months into the pandemic, how effective it will be, and who will be prioritized to receive it. All of which underscores the need for a `universal' flu vaccine; one that protects not only against seasonal strains, but against novel flu viruses as well (see J.I.D. 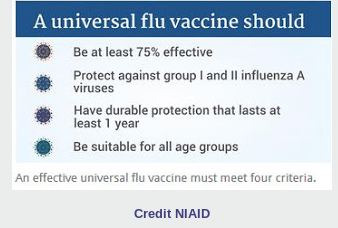 : NIAID's Strategic Plan To Develop A Universal Flu Vaccine). While not a panacea for a pandemic, an effective universal vaccine (particularly if it's been in use for a few years) would provide a huge leg up against an emerging influenza pandemic. Manufacturing and deploying on a global scale would remain a logistical challenge, but it would beat starting from scratch. The reality is - assuming that one can be created - we are probably still at least 5 years away from seeing a universal flu jab, and there are a lot of questions over just how effective it might be against novel (non-H1, H2, H3) flu strains. Which leaves us - for the foreseeable future - dependent upon current vaccine technology, and desperately in need of effective vaccines against the most obvious novel flu threats. And right now, despite its recent lull in China, that means H7N9. The CDC's IRAT (Influenza Risk Assessment Tool) currently tracks 12 additional novel flu subtypes/strains that circulate in non-human hosts and are thought to possess some degree of pandemic potential. And we could always be blindsided by something not yet on our radar. Work began on an H7N9 vaccine almost immediately after it appeared 5 years ago in China (see 2013's NIH Begins Phase II Clinical Trials On H7N9 Vaccine Candidates), with results expected in late 2014. Given the difficulties encountered in the middle of the last decade developing an effective H5N1 vaccine (see 2007's Sanofi Vaccine Hits A Snag), problems were not unexpected. In October of 2014, in NIH: H7N9 Vaccine Candidate Works Much Better With An Adjuvant, we learned that the H7N9 candidate vaccine only produced an acceptable immune response when administered with an adjuvant. According to their study: Without adjuvant, immune responses produced by the investigational vaccine were minimal regardless of vaccine dosage. The following summer, in JAMA: Immune Response Of H7N9 Vaccine With & Without Adjuvant, a new study confirmed the earlier finding – that without an adjuvant – the H7N9 vaccine’s effectiveness was abysmal. The bottom line, without an adjuvant, only 2% of vaccine recipients saw an acceptable immune response (HAI Titer > 40). Two 15 µg shots were still required, but those who received ASO3-adjuvanted vaccines were more likely to mount an acceptable immune response (84%) compared to those who received the MF59 adjuvanted formula (57%). 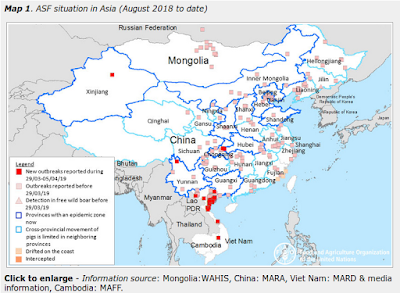 Last year, we learned the H7N9 virus had split into two major lineages - Pearl River Delta and Yangtze River Delta - (see MMWR:Increase in Human Infections with Avian Influenza A(H7N9) In China's 5th Wave). This new (Yangtze River Delta) lineage had changed enough antigenically that it requires a new vaccine - and that means a new round of vaccine development and testing must begin. Two new clinical trials testing an experimental vaccine to prevent influenza caused by an H7N9 influenza virus are now enrolling volunteers at sites across the United States. The Phase 2 studies, sponsored by the National Institute of Allergy and Infectious Diseases (NIAID), part of the National Institutes of Health (NIH), will test different dosages of the inactivated influenza vaccine candidate (called 2017 H7N9 IIV) as well as different vaccination schedules. The studies also will evaluate whether an adjuvant boosts the immune responses of people receiving the vaccine. H7N9 is an avian (bird) influenza virus first reported in humans in 2013 in China. Since then, six waves of H7N9 infection have occurred in China, resulting in more than 1,500 cumulative human infections, according to the World Health Organization. No human cases of H7N9 influenza have been detected to date in the United States. Currently, the virus does not spread easily from person to person; rather, people typically become infected through direct exposure to infected poultry or contaminated environments. However, if the virus mutates and becomes easily transmissible between humans, it could result in an influenza pandemic because most people have little to no immunity to it. H7N9 has a high mortality rate, resulting in death in 39 percent of those who became infected. Despite the many challenges, influenza vaccines are generally easier to create than for some of the other pandemic contenders out there. Five years after MERS-CoV emerged on the Arabian Peninsula, we still don't have a vaccine for humans, or for camels. In 2003, a close cousin to MERS called SARS emerged in China, and infected 8,000 people around the globe. After 15 years of research, a safe and effective SARS vaccine remains elusive. In 2012, a PLoS One research article found that mice vaccinated with four different experimental SARS candidate vaccines developed the expected antibodies, but experienced lung damage when challenged with the virus. These SARS-CoV vaccines all induced antibody and protection against infection with SARS-CoV. However, challenge of mice given any of the vaccines led to occurrence of Th2-type immunopathology suggesting hypersensitivity to SARS-CoV components was induced. Caution in proceeding to application of a SARS-CoV vaccine in humans is indicated. With a growing list of SARS-like coronaviruses being discovered in the wild (see PNAS: SARS-like WIV1-CoV Poised For Human Emergence), we may need a safe and effective SARS vaccine sooner rather than later. The recent debacle over Sanofi's Dengue vaccine in the Philippines (see WHO Unveils Interim Dengue Vaccine Recommendations) illustrates just how difficult, time consuming, and unpredictable vaccine development and testing can be. Vaccines are wonderful tools and may be invaluable during the second wave or in stamping out the remnants of a pandemic - but given the amount of time they take to create, test, manufacture and deploy - are unlikely to have much impact during the opening months (or longer). Unless we are exceedingly lucky, we'll have to make do with a wide range of Non-pharmaceutical Interventions (NPIs) - which, while not ideal - can be surprisingly effective if properly pursued. Nonpharmaceutical interventions (NPIs) are actions, apart from getting vaccinated and taking medicine, that people and communities can take to help slow the spread of illnesses like influenza (flu). NPIs are also known as community mitigation strategies. Measures like social distancing, hand hygiene, staying home when sick, avoiding crowds, wearing a mask if you are sick, even the closure of schools or other public venues are all potential NPIs. Although there may be other pharmaceutical options - like antivirals - available at the start of an epidemic, those will be in finite supply and are not a panacea for infection. Prevention is always better than treatment, but never more so than during an epidemic or pandemic, when treatment options may quickly become limited. In last year's Community Pandemic Mitigation's Primary Goal : Flattening The Curve we looked at the primary goal of the HHS/CDC's 2017 revised Community Mitigation Guidelines to Prevent Pandemic Influenza - which is to slow the spread of any severe outbreak, in hopes of limiting its impact on hospitals, essential workers, infrastructure, and ultimately reducing the death toll. Hospital beds, ventilators, even hospital staff - may all be in short supply during a pandemic (doctors and nurses get sick, too) - which makes it all the more imperative we flatten the curve - even if it means extending the duration of a pandemic wave. While telling people to wash their hands, cover their coughs, avoid crowds, and stay home while sick may seem like a weak response to a pandemic - in truth, they (and other more disruptive measures like school closures, cancellation of public events, etc.) may be our most powerful weapons in any pandemic. Hopefully the unexpected lull in H7N9 outbreaks in China this winter will provide enough of a window for these new clinical trials to complete (results expected in the fall of 2019), but having this one vaccine only helps if H7N9 is the cause of the next pandemic. As we discussed a week ago in WHO List Of Blueprint Priority Diseases, there are plenty of other contenders. Last May, in World Bank: World Ill-Prepared For A Pandemic, we looked at a 131-page working paper from The World Bank, that warned that far too many nations have let pandemic preparedness slide, and that the world remains unprepared to face even a moderately severe pandemic. A conclusion not unlike that reached in 2015 by a World Bank Poll: Majority Believe World Is Not Ready For A Pandemic, and by a 2011 WHO Panel: World Ill-Prepared To Deal With A Pandemic. In 2015, we looked at an 84-page Bipartisan Report of The Blue Ribbon Study Panel On Biodefense that looked at our nation’s vulnerability to the triple threat of a biological attack, an accidental release, or naturally occurring pandemic with a highly pathogenic biological agent. Their conclusion? We aren't anywhere near ready. I can't tell you what will spark the next severe pandemic, or how soon it will arrive. Only that each day that passes brings us closer to that day, and that when it does happen, we will find ourselves with precious little time to prepare. to Help Low-Resource Populations Mitigate a Severe Pandemic?